The homework #8 [HW#8] has been posted online. The due date is Monday, May 21, 2012. The homework #7 [HW#7] has been posted online. The due date is Monday, May 14. The homework #6 [HW#6] has been posted online. The due date is Wednesday, May 2. The homework #5 [HW#5] has been posted online. The due date is Wednesday, April 11. The homework #4 [HW#4] has been posted online. The due date is Wednesday, March 28. The homework #3 [HW#3] has been posted online. The due date is Wednesday, March 21. The homework #2 [HW#2] has been posted online. The due date is Wednesday, March 14. The homework #1 [HW#1] has been posted online. The due date is Monday, March 12. The main goal of this course is to provide to the students a solid background in analysis and design of nonlinear control systems. Many control systems of practical importance are inherently nonlinear. A common practice for control system design is to linearize the system to be controlled around some equilibrium or operating point through small perturbation state approximations. The key assumption is that the range of operation is restricted to a small region around the equilibrium on which the linear model remains valid. As a consequence, adequate control is only guaranteed in a neighborhood of the selected operating points. 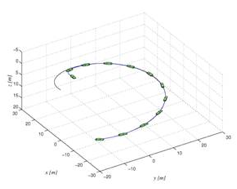 Moreover, performance can suffer significantly when the required operating range is large, such as when controlling an autonomous vehicle that executes maneuvers that emphasize its nonlinearity and cross-couplings. This course covers the analysis and design of nonlinear control systems and is suitable for post-graduate students in science and engineering. The course begins with an introduction to nonlinear system theory and stability analysis. Topics include Lyapunov stability analysis techniques, stability of perturbed systems with vanishing and non-vanishing perturbations, input-to-state stability, input-output stability and passivity. The last part of the course is dedicated to nonlinear control design tools such as feedback linearization, sliding mode control, Lyapunov redesign, backstepping, passivity based control and nonlinear adaptive control (if time permits). Emphasis is placed upon application of the theory to systems of interest to the students. Basic knowledge of calculus, linear algebra and ordinary differential equations is assumed. Office Hours: Please email or phone in advance to schedule an appointment. Main: Khalil, H. K. Nonlinear Systems, 3rd Edition, Prentice Hall, Upper Saddle River, NJ, 2002. Complementary: Collection of journal papers. Solution of a research problem relevant to the student’s area of research, which makes use of methods described in the course. Independent study of a topic not covered in-depth in class (e.g., reading a paper or book chapter). Nonlinear systems vs. linear systems, multiple isolated equilibrium points, finite escape times, limit cycles. Normed vector spaces. Induced norms. Mean value and implicit function theorems. Gronwall-Bellman inequality. Lipschitz condition. Local and global existence and uniqueness of solutions. Continuity with respect to initial conditions. Comparison Principle. Autonomous Systems. The Invariance Principle. Linear Systems and Linearization. Comparison Functions. Nonautonomous Systems. Linear Time-Varying Systems and Linearization. Converse Theorems. Boundedness and Ultimate Boundedness. Input-to-State Stability. Memoryless Functions. State Models. Positive Real Transfer Functions. L2 and Lyapunov Stability. Feedback Systems: Passivity Theorems. Absolute Stability: Circle Criterion, Popov Criterion. Vanishing Perturbation. Nonvanishing Perturbation. Comparison Method. Motivation. Input–Output Linearization. Full-State Linearization. State Feedback Control. Stabilization. Tracking. Sliding Mode Control: Motivating Example, Stabilization, Tracking, Regulation via Integral Control. Lyapunov Redesign: Stabilization, Nonlinear Damping. Backstepping. Passivity-Based Control. Basic nonlinear adaptive control design.